Classify this one under the same nonsense as the “Bigfoot on Mars” the wooden plank on Mars, or perhaps even the “Face on Mars.” Just an optical illusions, folks from a very, very zoomed in image from the Mars rovers. The Sun newspaper seemingly started this foolishness on what must have been a slow news day. The original image has been around awhile. It was taken by the Opportunity rover back on sol 87 in 2004. Click here to see the original image. Can you see any gorillas? I’m sure if you look really close and zoom in and distort any of the rocks you can see whatever you fancy. A real planet of the ‘ape’. Again as usual a black&white picture!! nasa must think we are all color blind. Well, in swedish that would be a given – an old and slightly ungrammatical pun on gorilla is “walk bad” (sv: “går illa”, pronounced gor´illa) – and all those funnily broken rocks would make for bad footing indeed. On second thought, an also allowed and more correct translation would be “walk badly”, it is some redundancy in these expressions. Less but still ungrammatical I guess. The Sun…. it makes you proud to be British. It should be reclassified under “Comics”, rather than “Newspapers”. It’s Bigfoot and Bat-Boy’s love child! 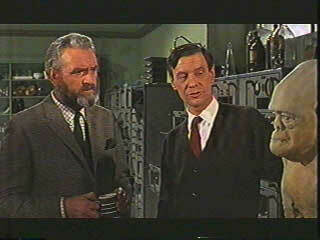 Maybe it’s the genetically altered ‘ape-man’ as portrayed in the movie Quatermass and the Pit! hey, speaking of conspiracies, does anyone know what happened to the Weekly World News here in the US? it’s been months since I’ve seen it on the stands, I miss it. The Sun’s got nothing on the good ol’ Weekly. I think Weekly World News went out of business. Too bad in a way, some of their stuff was positively hilarious. I bought a few of them, like the skelitons embracing each other with the caption about gay lovers from the Titanic, the Martian cats found by Mars rovers and so forth. The guys who worked there must have had regular 10 martini lunches. All I see is what looks like…ummm…errr…a rock. Not really sure how anyone got anything else out of that one. Now I know where my ex-moher-in-law and her folks come from. It looks like one of the Herculoids…. He was of course the pilot of Beagle 2. The Mars Rovers are over worked, been on Mars far too long starting to Hallucinate. Or the folks at Sun newspaper are Hallucinating, Stay off cheep drugs. Its clearly a Bull with hairy body with funky hair. Okay Gilligan.. so you saw BigFoot… What are you going to do about it? Hi there! I have found a photo take later the same day. This one is a little clearer!